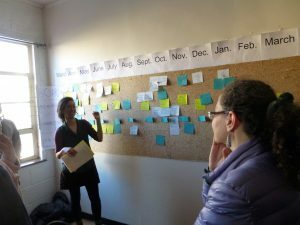 The Founding Board, led by Oksana, held a well-attended organizational planning meeting to plan our strategy and a timeline for the long-term, over the course of the next year. The workshop sessions were facilitated by Lauryl Berger-Chun at Mayday Community Space, and we started with a delicious Lebanese lunch from another (woman-owned and run) cooperative, Emigre Gourmet. The workshop sessions allowed for the greatest inclusion of member input and discussion, as we thought about where the REIC stands now, where we are trying to get over the coming year, and how to get there, gathering all the tasks that need to be completed, putting them into various categories, distributing them over a timeline, and also taking personal responsibility for them. We now have a spreadsheet to work with, and to more easily plan the next steps. More to come for both those who attended and those who are interested in taking more active roles. REIC U reconvened in February, setting three committee objectives: (1) hosting regular social/educational events; and the next two in cooperation with CORB: (2) creating an all-member orientation on the REIC + training in community outreach; and (3) developing marketing materials. Members were tasked with identifying meeting venues (and adding their details to this spreadsheet – please add to it!) for future events. Please join us for our March meeting by providing your info and availability in this form! At this next meeting, we will confirm logistics for our first 2017 event (a film screening in Apr/May), lay out the types of events we’d like through the rest of the year, map out curriculum sections and stakeholders for the training, and agree on marketing material to develop in the next few months. Stay tuned to our Event Calendar for our next open meetings! Contact us at steering@nycreic.com and by voicemail at (718) 316-6092 ext. 5. We are now in the final phases of the creation of a new graphic identity for the REIC, with huge thanks to Roy Rub and Seth Labenz of Topos Graphics for their pro bono work! We have already taken a poll among the Founding Board members and a couple of other active members, especially with respect to communications and design – and the two directions are still polling extremely close – with a slight advantage to the Building Material version. We would like to ask for your feedback, as well – before we get back to the designers for final tweaks – and a final graphic identity for the NYC REIC. Please vote on which of the two versions you would like to develop, by clicking the link below. Please do this BEFORE Monday, March 27. Just to be clear: Each person has 3 votes. This is so that if you have a mild preference, you can place 2 votes on one side and 1 vote on the other. If you have a strong preference, you can place 3 votes for only one option. Please keep an eye out for an upcoming screening event in April/May! REIC U is the committee of the REIC that creates educational programming for our membership and the public. We are also looking for members who can help with translation, where necessary – whether from Spanish, Chinese, Russian, or other languages. Donate for the future of NYC! We have almost completed our 2-year incubation period! 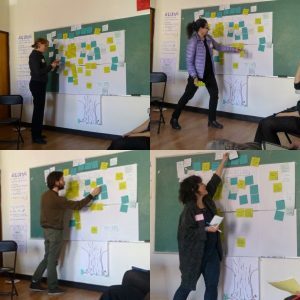 Help us get there: make a tax-deductible donation to the NYC REIC, help us find and apply for suitable grants, or donate your pro-bono professional services in real estate, finance, accounting, web design, graphic design, development, facilitation, law, or something else. Your donation will support the creation of a new infrastructure for social investment in the places that make NYC livable and great! During this period, fiscal sponsorship is provided by Spaceworks NYC, a 501(c)(3) not-for-profit cultural community development organization dedicated to expanding the supply of long-term, affordable rehearsal and studio space for artists in New York City. Thanks, Spaceworks! info@nycreic.com |||||||| (917) 727-8465 |||||||||||||||| Any information or materials provided NYC REIC, Inc. on this webpage are for informational purposes only and are not an offering. No offering is made except by a prospectus.